Vishal stressed that Mysskin’s vision is the reason behind the good response to ‘Thupparivaalan’. 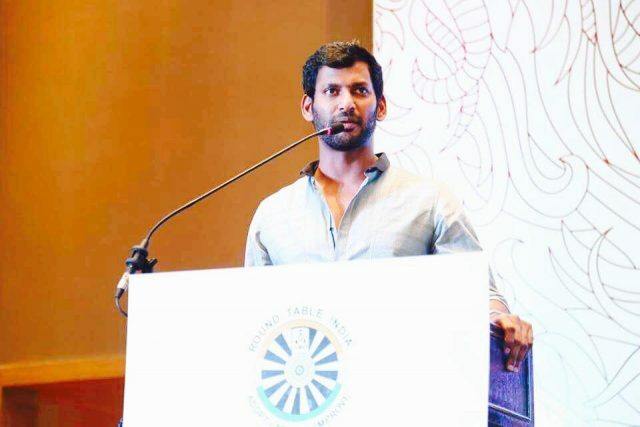 During an interaction with the media in Malaysia, actor Vishal opened up about the phenomenal response to his recently released ‘Thupparivaalan’ and said the credit for its success goes to none other than director Mysskin. He went on to jokingly add that add that he was a bit reluctant to be a part of the film as Mysskin—just like him—is a little ‘psychotic’. “When we started the project, many hesitated to produce the movie. It was because I am slightly psychotic — and so is Mysskin. They were wondering if the final product would turn out properly. Nevertheless, I am happy to the huge response for the film, which I made under my home banner VFF. As far as Thupparivaalan’s success is concerned, all credit goes to Mysskin,” he added. Besides this, he also added that the Nadigar Sangam will soon be organising a cultural event in Malaysia. He further stressed that it will be a star-studded extravaganza. “We did the ‘Star Cricket’ matches in Chennai which was a hit and planned to do a similar event here. But, we came to know that more than cricket, football seems to be the favourite sport of Malaysians! So, this glitzy event will have all the artistes — even actors like Rajinikanth and Kamal Haasan will be part of it. All arrangements are being made with the support from Malaysia’s Tourism department,” added Vishal. Well, we hope that Vishal finds success in all his future ventures and continues being an integral part of Kollywood.